This week our prompt at Every Inchie Monday is EMOTION. I chose Theater Muses. Where in the world can you find such highs and lows of emotion except in the real world from whence the playwrights draw their stories. A one inch square from some Brusho paper and hand drawn Muse masks. Sticking with emotion, we've hit November 2 so put on a Happy Face and let's all slide into the Holidays together. I love the background paper to your inchie. The hand drawn masks are awesome as well. wish we had holidays in november - instead we usually get snow - but am happy so far this year as we are having record high temperatures and only a few nights below freezing so far. I used the masks too as they truly are expressive of the topic - well drawn. 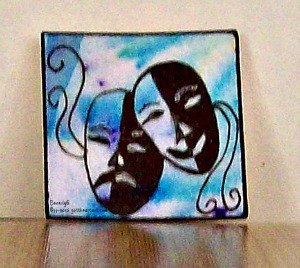 Your masks are so well done, Beverly, and I like the background coloring as well! Love the masks on you inchie.